Virginia Gov. Terry McAuliffe visits Inova Loudoun Hospital in Leesburg to rally support for the expansion of Medicaid. The expansion of Medicaid through the Affordable Care Act (aka Obamacare) has been uneven. The country is split down the middle on the issue, with 25 states choosing to broaden coverage and 25 choosing not to. But many more uninsured, low-income Americans — the people most likely to benefit from expanded government health insurance — live in states that, so far, have opted out. Some 8.5 million uninsured adults would be newly eligible for Medicaid if the expansion were implemented in their states. That’s more than the 6.6 million who are eligible in states that have expanded coverage. But the disparity doesn’t end there. A new study shows that low-income people in states with expanded Medicaid coverage are generally healthier than their counterparts in states with more limited coverage. The study, published online Monday in JAMA Internal Medicine, compared health data from nearly 19,000 uninsured adults in all 50 states and Washington, D.C., whose family income is 138 percent of the federal poverty line or less (the Medicaid eligibility threshold set by the Affordable Care Act). The researchers found that five medical conditions — high blood pressure, heart problems, cancer, stroke and emphysema — were significantly more prevalent in the states that have not expanded Medicaid. No statistically significant difference was found in the prevalence of a sixth condition, diabetes. 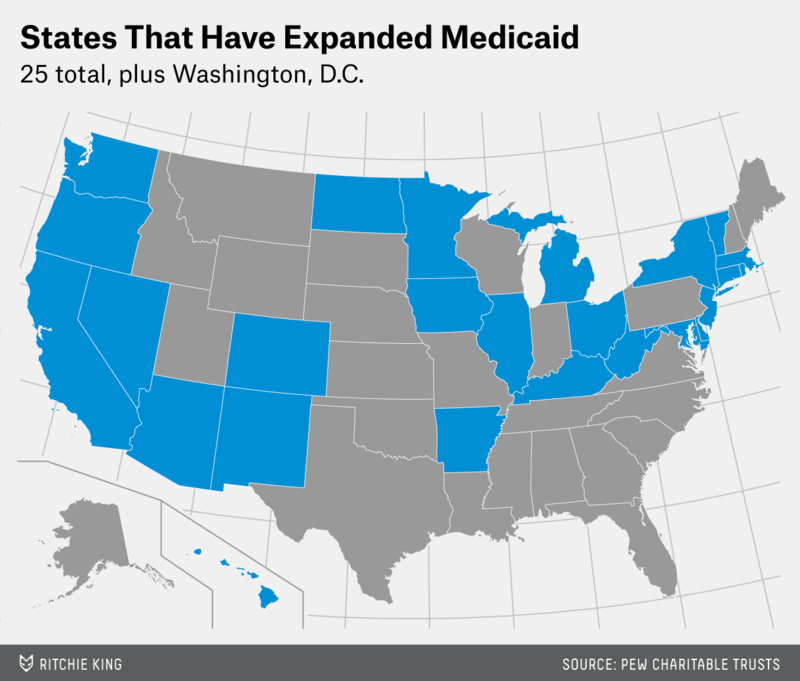 The Affordable Care Act was designed to expand Medicaid eligibility across the country. But in 2012, the Supreme Court ruled that each state and the district should be able to decide whether to broaden that eligibility starting Jan. 1 of this year. 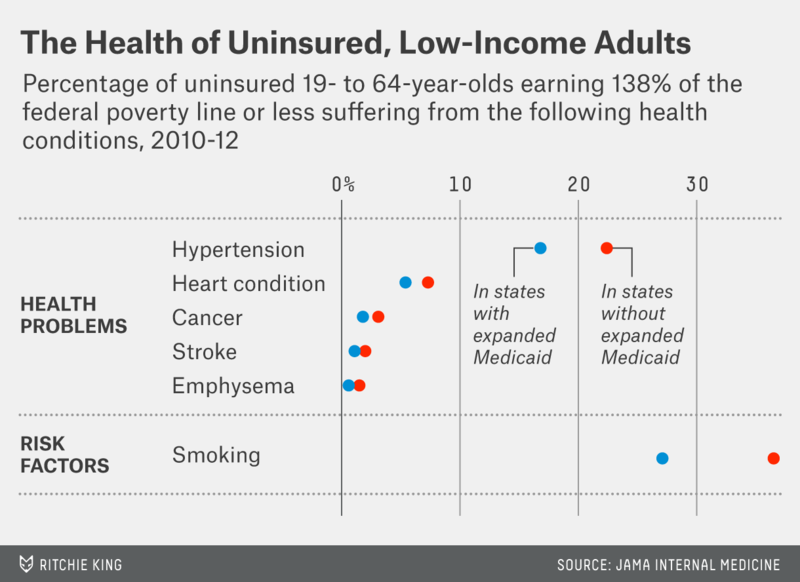 So why are the low-income uninsured in the gray states above less healthy than those in the blue states? Sandra Decker, a consultant at the Centers for Disease Control and Prevention and the lead author on the study, said the answer is unclear. In an email to FiveThirtyEight, she said a number of factors could be at play. The low-income uninsured in non-expansion states could be poorer than those in expansion states, possibly exacerbating health problems. Or, she said, it’s possible that differences in exercise, diet, smoking habits or even employment are causing the observed health disparity. But “any attempted explanation is speculative,” she cautioned. Reasons aside, it’s a sad irony of Medicaid’s uneven expansion that the people who aren’t getting coverage appear to need it most.